Earlier this month, there was a great yard sale taking place down the street from The Girl's school. The gentleman running the sale had all sorts of things buried in boxes and set up across numerous tables and it was all going for pennies on the dollar. I got there a split second too late to nab a huge ball jar with class lid (for ONE DOLLAR!!!) 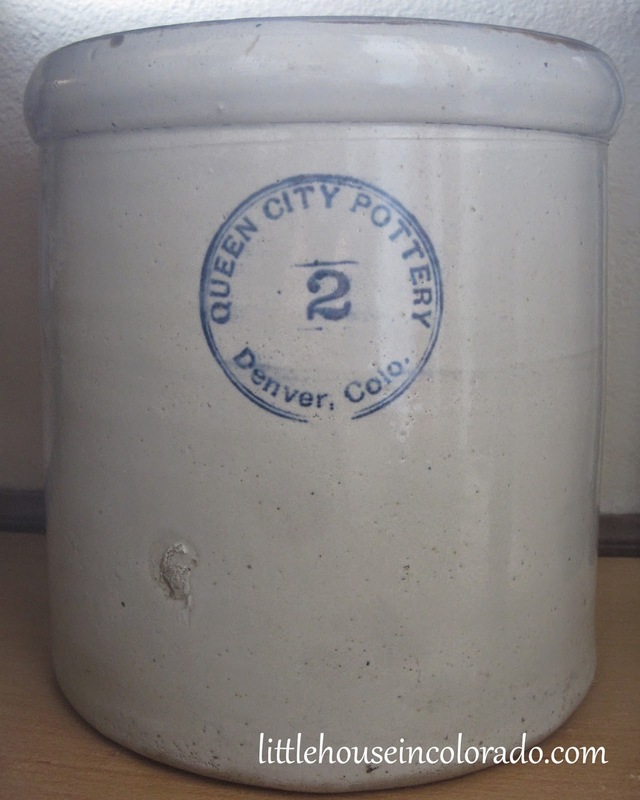 but buried among tool boxes beneath a table was this stoneware crock. The outside was covered in dirt and there was no telling what it had been used for before finding itself tossed out with the rest of the goods. I wish now that I had taken a "before" picture because it really looked rough. I was told a similar jug-type crock went earlier for "a steal" so he would have to ask a little more for this one...$4. I had been searching for crocks for awhile. New crocks of this size go for more than I wanted to spend right now, but still reasonable (Ace Hardware has their Ohio Stoneware 2 Gallon Crock for just under $30). I paid the $4 immediately without knowing what the condition of the crock was under all that dirt. It was then stashed safely in the car before I resumed my browsing at the yard sale. When I got home, I started cleaning up the crock. 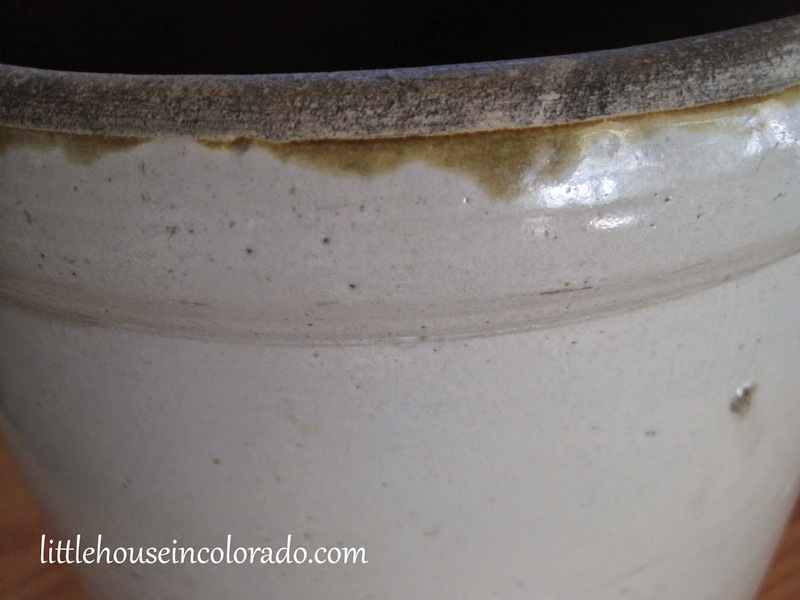 I was giddy with excitement the whole time (the glaze was still gorgeous). There was a tiny crack in the base but otherwise it still looked fantastic! 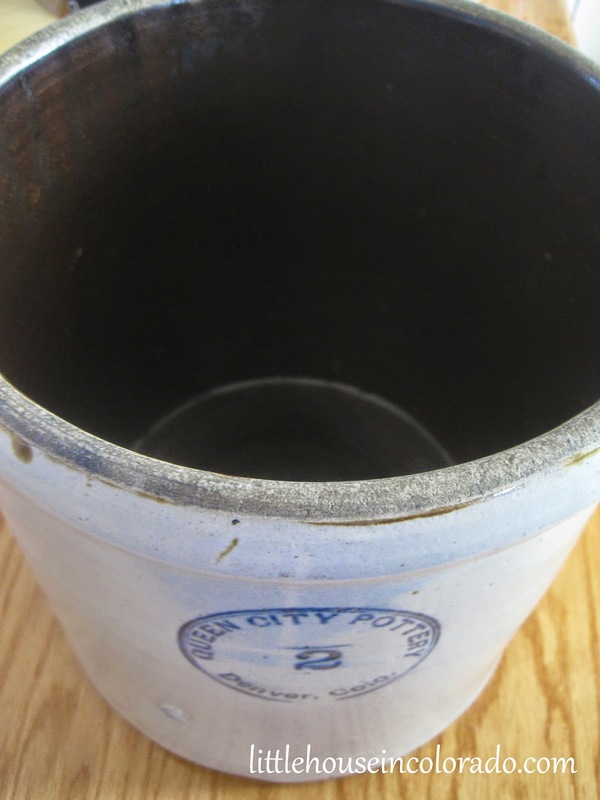 Finding any information was difficult and the only other image of a crock similar to this one that I could find was on eBay but even it has a much different shape around the rim (less rounded) and didn't appear to be in as good condition. It was also all light colored while mine had a dark brown interior. I'm not sure yet what I'll do with this yard sale find. The hairline crack keeps me from wanting to make pickles in it but it's beautiful and has character and I know it will have a prominent place in our home. The Boy had to create a product for his Social Studies business lesson. 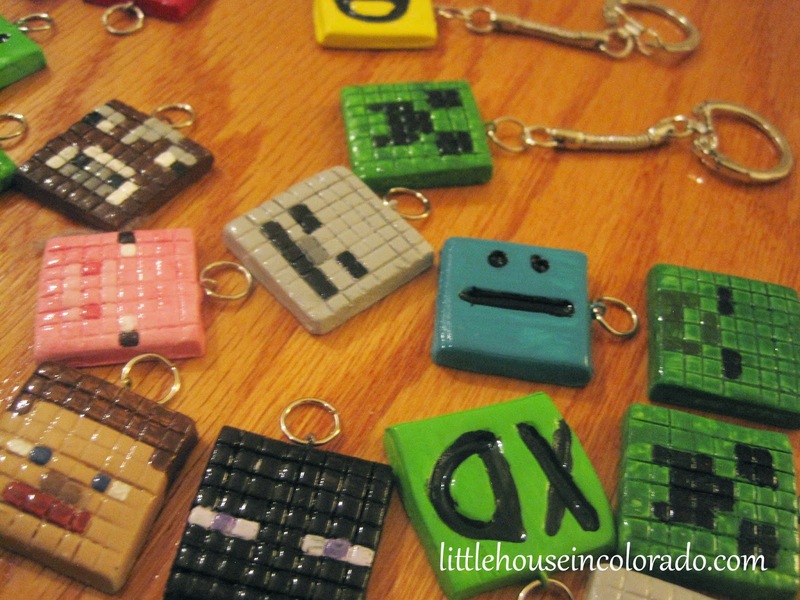 He chose to make Minecraft charms made from Sculpey polymer clay. When we sat down to actually make the charms, he announced we weren't JUST doing Minecraft charms. He also wanted to make Emoticon charms. The following are the instructions for the emoticon charms. 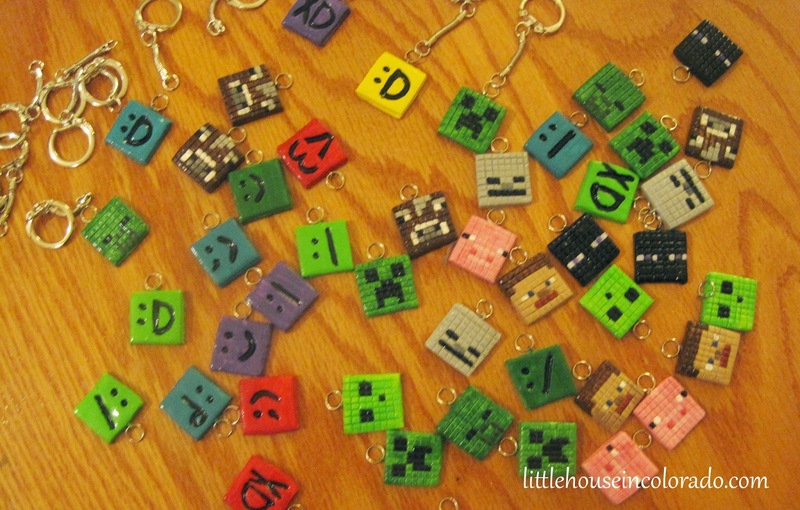 The Minecraft charms are also pictured in some of the images below but the instructions for making those are in another post. Super Glue (or other bonding agent) - this was used to secure the eye pin to the charm "just to be sure it doesn't come loose"
To make the Emoticon charms easier for "mass production" and a bit more "alike", we decided to make "stamps" from the clay. 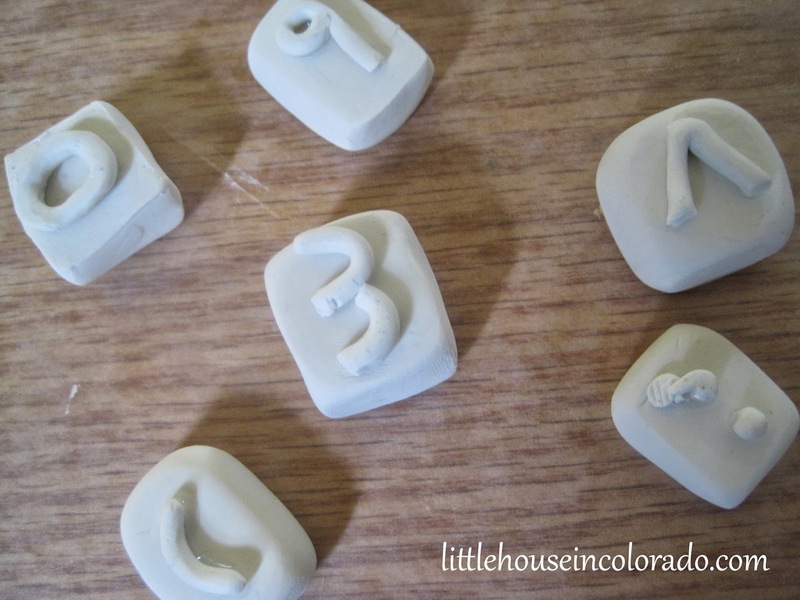 To make the stamps, simply form "blocks" from the clay. Then make all the symbols you need. Bake the pieces as directed then clue the symbols in place on each block. 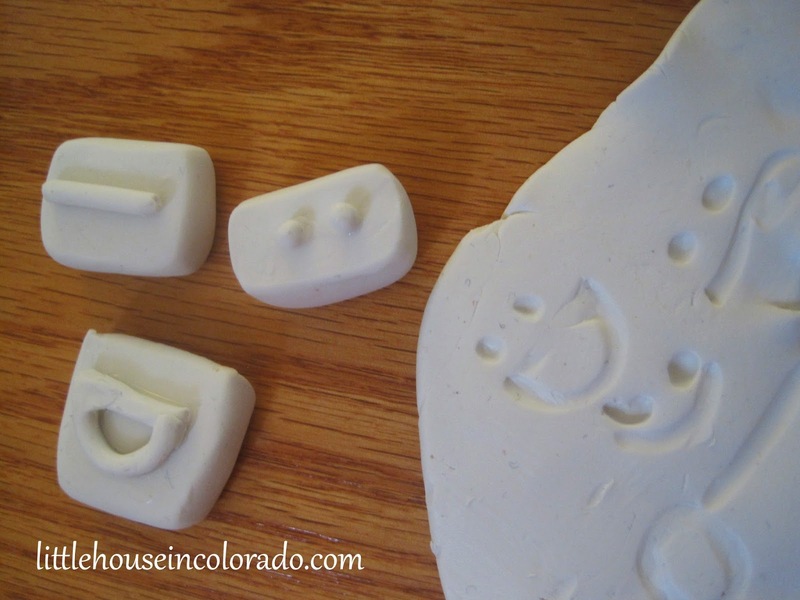 The baked clay stamps are perfect for making impressions in the soft clay. Making the pieces separate allows them to be used interchangeably. 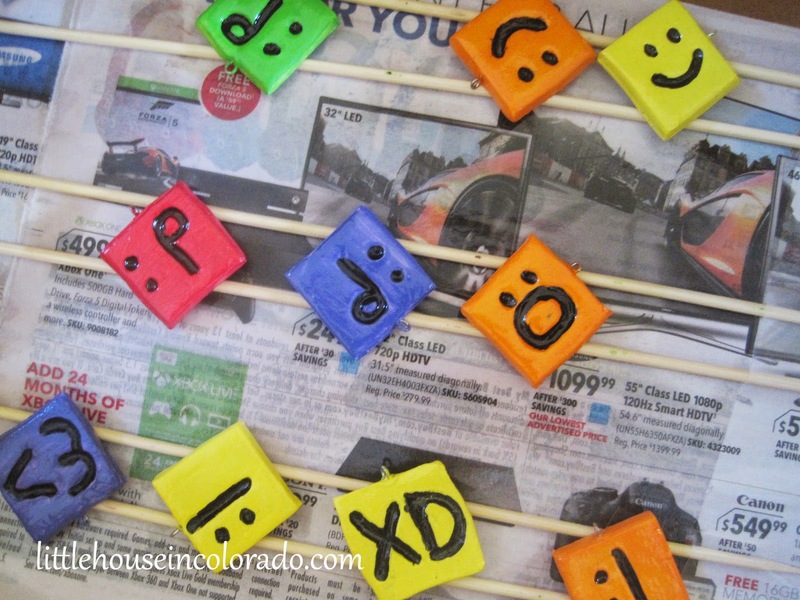 We used a large amount of clay to make the "stamps" for the Emoticon charms. 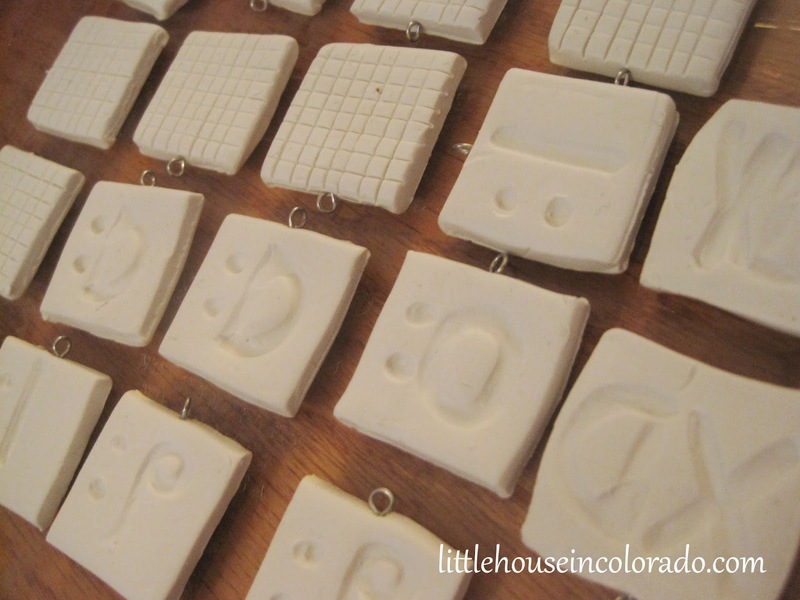 If you aren't making the stamps, a pound of clay will yield a whole lotta charms. Seriously. Even after making the stamps, we were able to make almost 90 charms from our pound of clay. It takes a little practice with the stamps to get a feel for how much pressure to use to make your imprints. 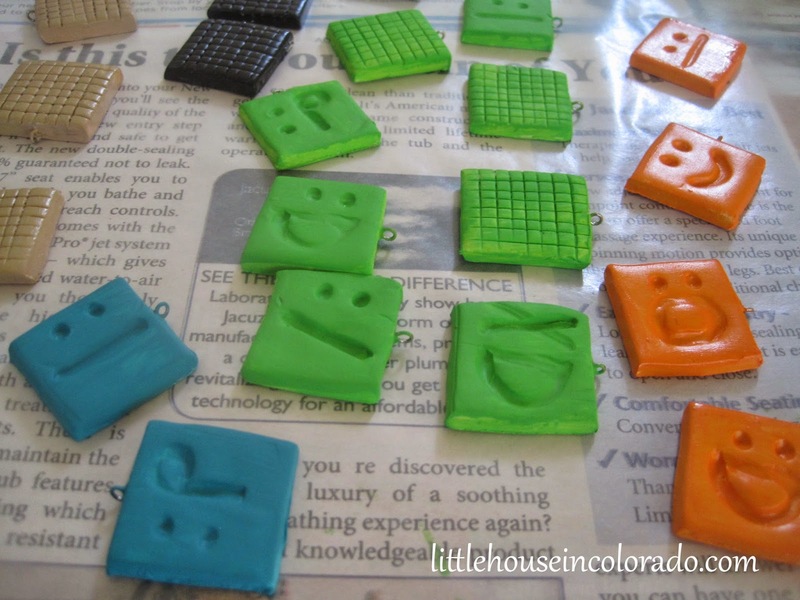 Roll out a piece of clay and make a few practice runs before using the stamps on your charms. 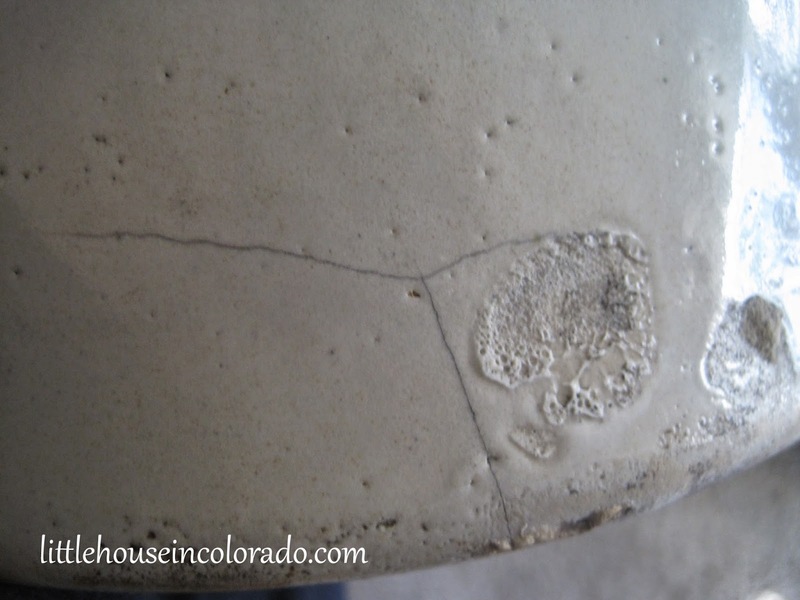 Once the stamps are completed, soften the rest of your clay by kneading it in your hands. Roll a section of clay out thin (about 1/8" thickness) on a sheet of wax paper (the wax paper is simply to protect your surface). 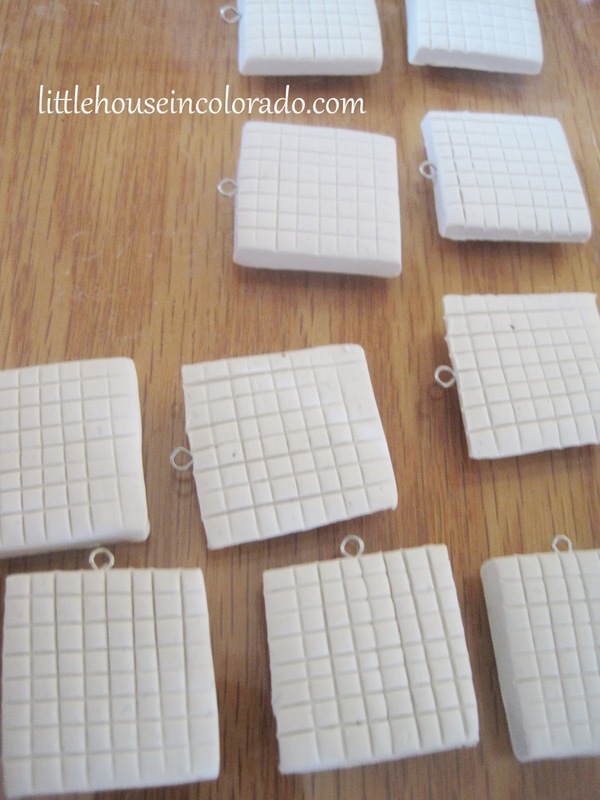 Cut the clay into 1-inch squares using a ruler and a knife or metal spatula. Push an eye pin into the top center edge of each square until the "eye" is flush with the clay (see image below). Press the stamps into each charm to create your desired Emoticon "face". Place the charms in your baking dish and bake as directed (we baked for 20 minutes at 275 degrees). Once baked, allow the charms to cool completely. I usually move clay to a cooling rack once they have cooled enough to handle. Carefully place a small dab of super glue on each charm where the eye pin meets the clay. This is to endure the eye pin is secured to the clay. 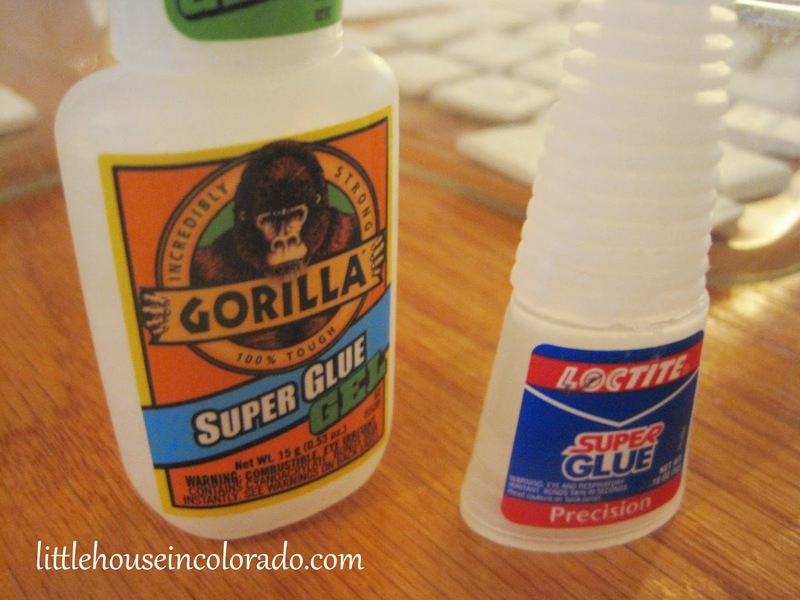 I used both of these super glue brands successfully but if you use the Gorilla Glue gel, you MUST shake it to get the gel to mix evenly. You can squeeze out a small dollop on a paper plate and hen use a toothpick to apply it to the charms. It also has a strong smell and the fume will burn your eyes so keep your face away from it and use in a WELL ventilated area. When the glue has dried, it is time to start painting. 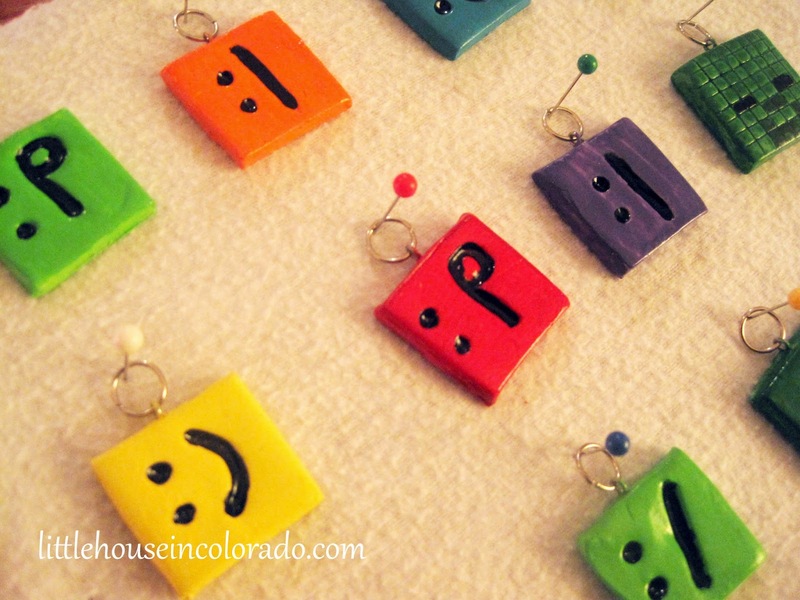 The Boy chose to use bright solid colors for his emoticon charms...red, orange, yellow, purple, teal, and lime green. The main colors were allowed to dry completely before the faces were painted. You can see here we had an assortment of flat and glossy paints. Since everything was getting a top coat of high-gloss cleat coat, it didn't matter whether the base coat was glossy or not. Using black paint and small brushes, we "filled in" the imprinted emoticon faces. After the black paint dried, all the charms were given several coats front and back of high-gloss clear coat spray and allowed to dry for a couple days. This gave the charms a thick glossy finish. 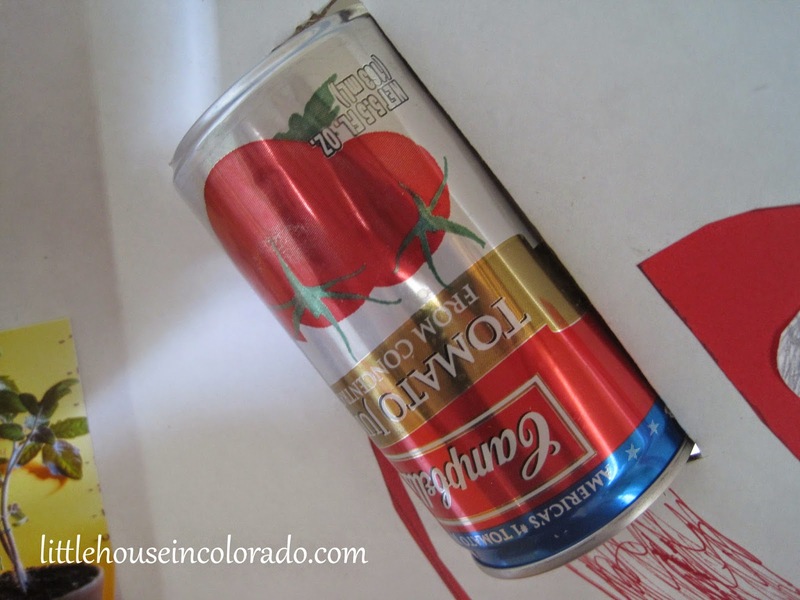 To spray paint the clear coat, we placed the charms in newspaper lined boxes boxes across wooden skewers. Attach jump rings to each of the eye pins to complete the charms. I wasn't expecting such a large project to be assigned so close to the end of the school year, but here we were staring at the information packet for the newest Social Studies business lesson with barely a month of school left. The Boy had three weeks to create and manufacture a product and put together a business plan and marketing campaign to go with it. 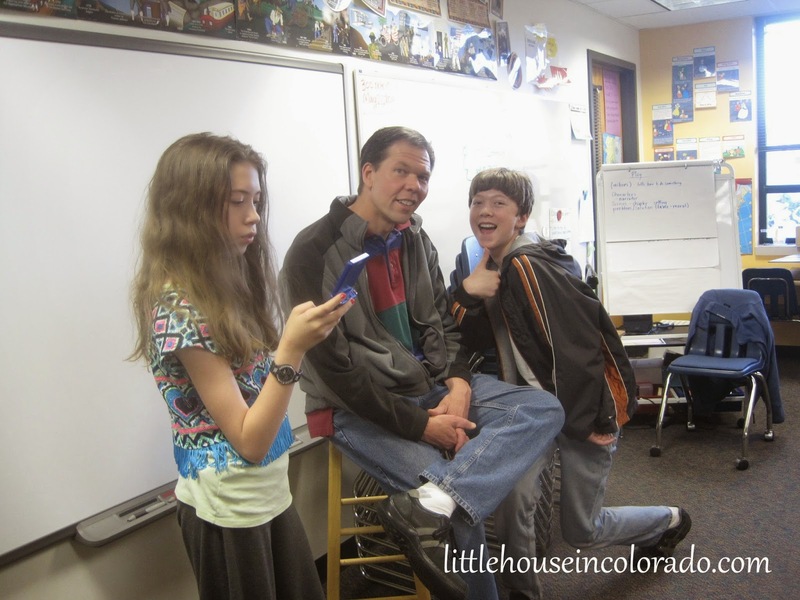 His class would create money to be earned in class during those three weeks (for things like good behavior) and the money would in turn be used to purchase products at the class sale being held at the end of the three weeks. The following day, ALL the social studies classes would get together with their items and currency for an "international sale". Sounds a bit like the 5th grade "mini society" I had many many years ago. The Boy had 2 possible product ideas for his business. 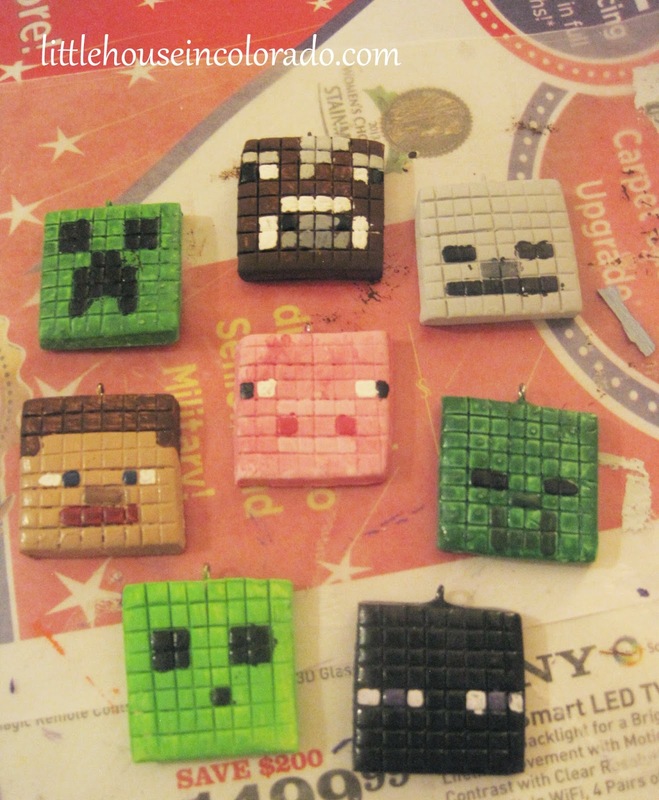 His 1st choice was Minecraft charms made from Sculpey polymer clay. His 2nd choice was survival bracelets made from polycord. Project materials could cost no more than $20 and we could certainly make more charms than bracelets for that price. Luckily, his 1st choice product was approved. He could get help (labor) from parents and siblings but would have to keep track of their time and "pay" them for their services with time. We agreed he would pay me with time spent doing extra chores. 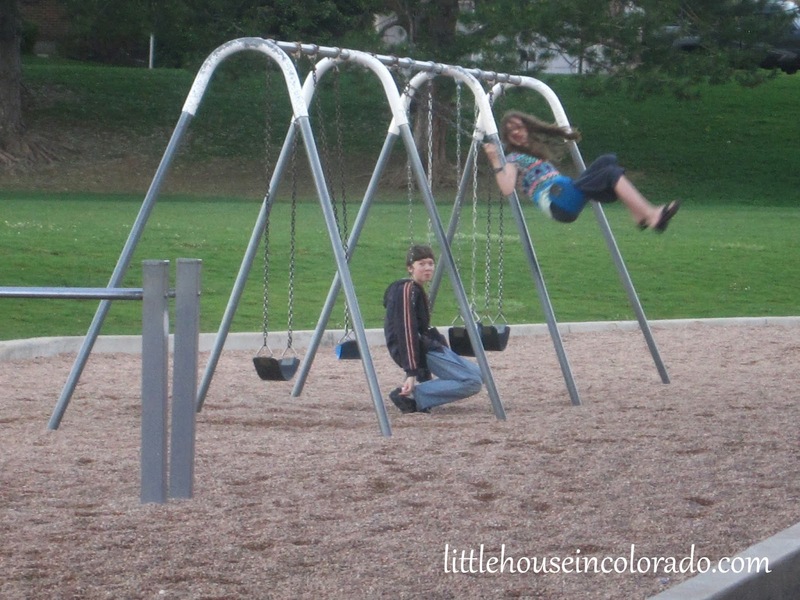 He would pay his sister with time spent playing HER choice of games or activities for a certain amount of time. The first order of business was to purchase any needed materials. Materials already owned did not count toward the $20 materials budget so we did not have to factor in the cost of paint, clear coat spray paint, and jump rings that were already in our craft stash. 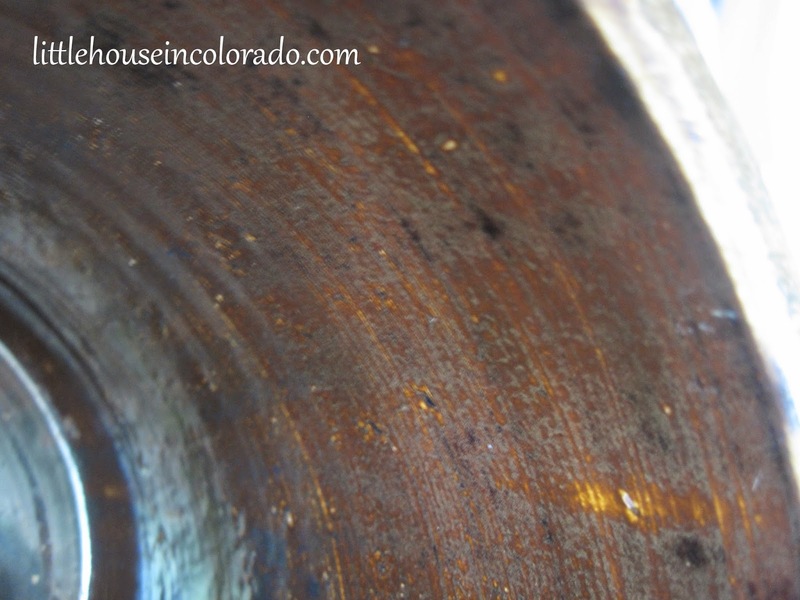 However, material from home could not be valued at more than $5 using "garage sale prices". We DID need to buy a lot of polymer clay, eye pins and key chains. We headed to the craft store and selected 2 packages of key chains (like these) and a package of eyepins (like these). 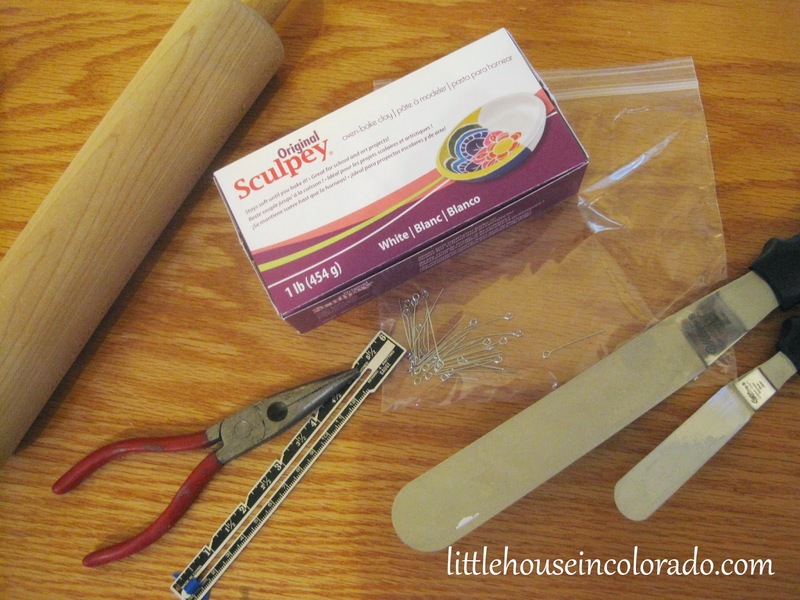 We also chose a 1-pound box of Sculpey Polymer Clay, usually $9.99 at our craft store but we had a 40% off one item coupon that dropped the price down to $5.99. (It was a good opportunity to show The Boy how a coupon could really help you out when you're on a budget.) Before tax, our total came to $13.58. NOTE: When we sat down to actually make the charms, The Boy announced we weren't JUST doing Minecraft charms. He also wanted to make Emoticon charms. I have included instructions for those in a different post but some of the images you will see here include those Emoticon charms. 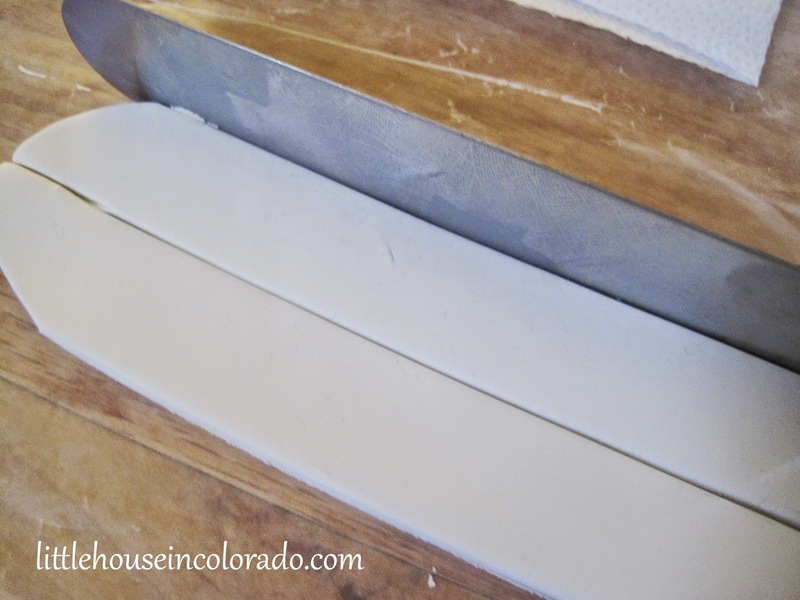 Soften clay by kneading it in your hands then roll a section of clay out thin (about 1/8" thickness) on a sheet of wax paper (the wax paper is simply to protect your surface). 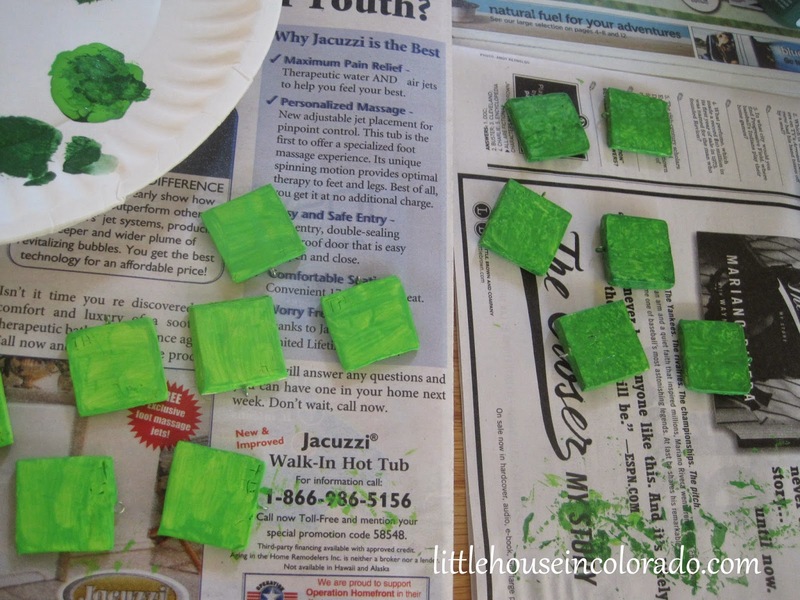 Cut the clay into 1-inch squares using a ruler and a knife or metal spatula. Push an eye pin into the top center edge of each square until the "eye" is flush with the clay. Using a straight edge (I used a metal spatula), make an 8x8 grid on each charm. Carefully place a small dab of super glue on each charm where the eye pin meets the clay. This is to insure the eye pin is secured to the clay. Once all the charms were dried, we began painting the background colors. 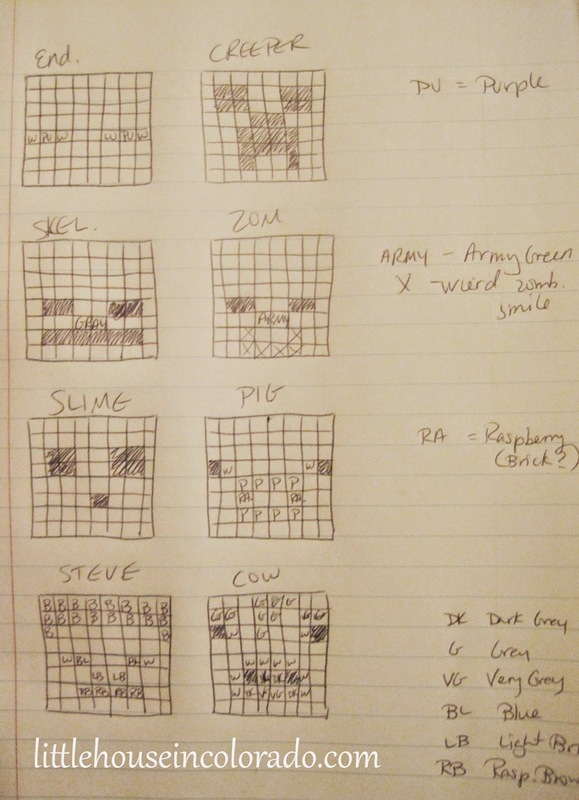 We made several Minecraft "mobs": Enderman, Creeper, Zombie, Slime, Pig, Cow, Skeleton, and then of course, Steve?. Those charms that had solid color backgrounds were easy: Enderman (Black), Skeleton (gray), Pig (pink), etc. But the creeper was pretty pixilated in greens so we combined 2 greens and dabbed the colors onto the charm making it "look" like different green colored pixels. "Slime" to the left and "Creeper" to the right. I had The Boy check online to see how each Minecraft mob's face looked and what colors should be used. Then each and every face was painted on. Once all the painting was finished and dried, we sprayed several applications of high-gloss clear coat spray over the front and back and allowed everything to dry for a couple days. Jump rings were placed on each eye pin and a couple of key rings were attached to charms as "display pieces". The boy "sold" the key chains separately since he only had 24 of them (they sold out during the first sale and a tornado warning kept us from going back to the store for more that evening). His display was simply a box flap covered in flannel. Straight pins were stuck through the flannel into the cardboard. The charms could be hug on the pins as a display. He sold all but 17 of his original 63 charms and all 24 of his key chains just during the class sale (And he felt pretty good seeing people wearing his charms on their belts and book bags after the sale). We had to hurry that night to make more product just so he'd have a selection for the international sale! We managed to make an additional 25 charms Thursday night for the 2nd sale on Friday and he came home with only three left. I'd say he was pretty successful! I don't know about you, but I've never really cared for store bought cole slaw - not even from the deli. It was cut too small. It was watery or bland tasting. It didn't taste fresh. It was...meh. Several years ago, Mr. LH stumbled across a KFC copycat recipe for cole slaw that he started making. It was delicious! The recipe below is an evolved version of that original. It has changed ever so slightly over the years as we tried to simplify it and tweak it more to our liking. This cole slaw is perfect on top of burgers and hot dogs but is also just as good as a side dish. We have made it in a food processor but find the texture of hand chopping the cabbage to be far superior in the finished recipe. 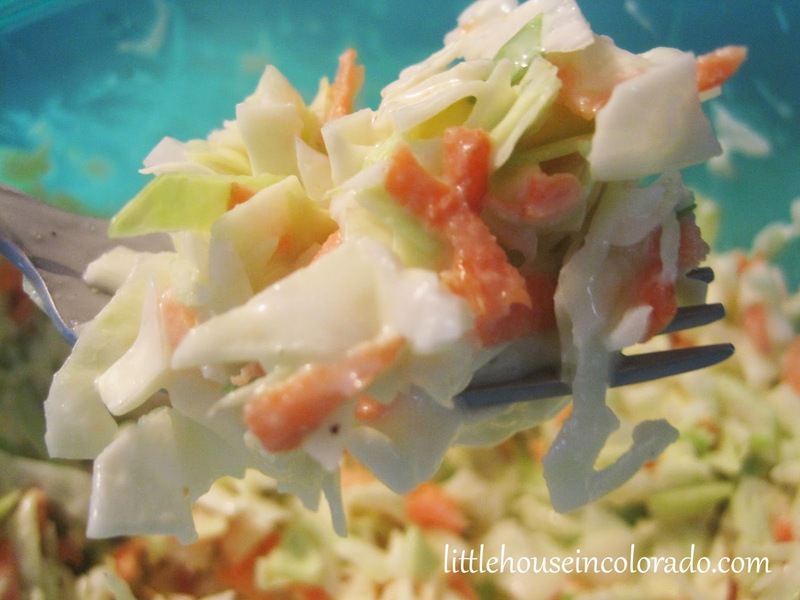 So, just in time for grilling season, here's a great cole slaw recipe to use this summer! In large bowl, combine cabbage, carrots and onion. In large 4 cup measuring cup (or a small mixing bowl), combine the remaining ingredients. Whisk together well. Pour over cabbage mixture. Toss to combine. Refrigerate for at least 2 hours before serving. More stormy adventures awaited us Wednesday afternoon. This time the storm sirens wailed while the "Pickles" were still at school. Mr. LH and I were both at home so we did what all adults do when they don't have to worry about setting a good example...we went outside to see if we could see the tornadoes. (Of course, I did this after I took an armload of stuff to the basement for safekeeping). Not seeing anything in our area, we parked ourselves on the couch and watched the crazy weather unfold on the news. 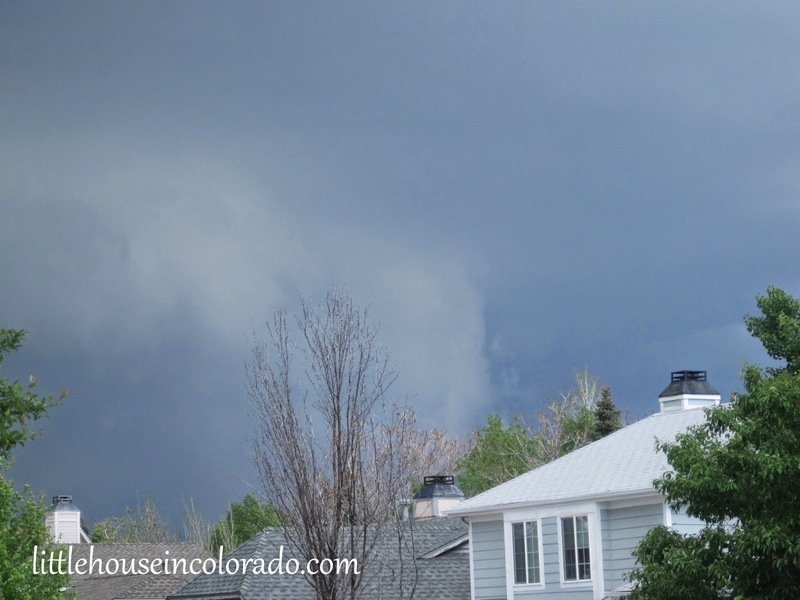 There were several confirmed tornadoes north and west of us, headed toward the airport. The schools would not dismiss students as long as there was an active tornado warning in effect so I would have to wait a few minutes longer to pick up the "Pickles". They had been in "Tornado Drill" mode for over an hour by the time they were able to leave. Once again, we rushed through homework and dinner preparations. 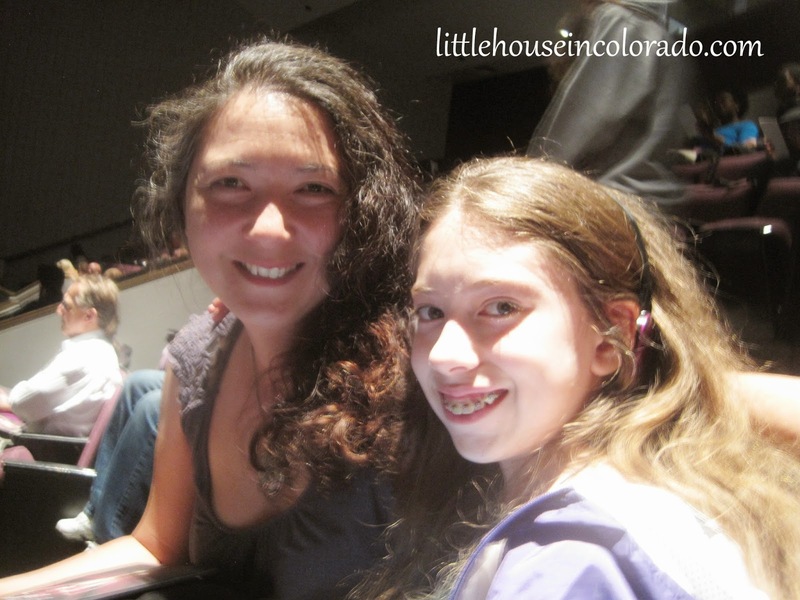 Tonight we had a science fair to get to! Since the students didn't have time to set up their projects before school dismissed, we made sure to get there early to do it. The Girl's class wasn't going to be judged for awhile so we had plenty of time to view other projects once she was set up and ready. The student observed which paw a cat used to bat at a toy. 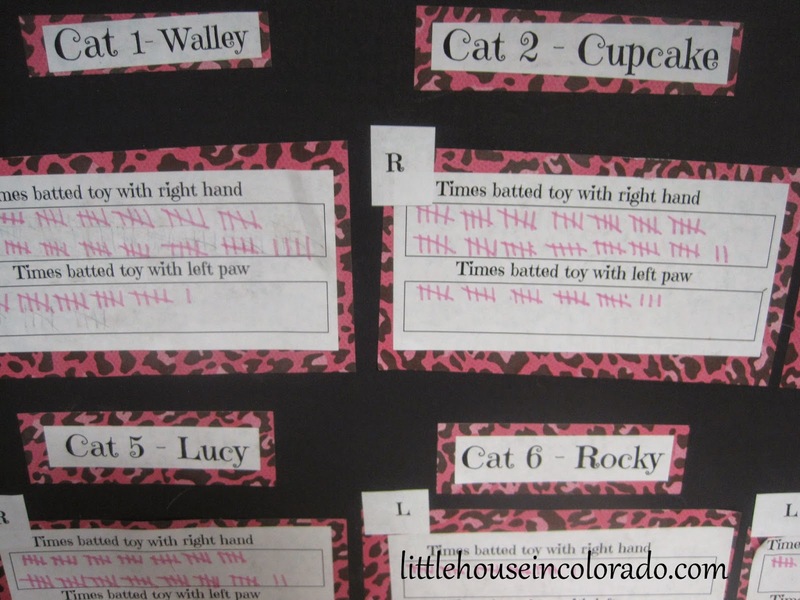 Looking at the data, I'd say cats DO have a dominant paw, though it seems evenly split between lefties and righties. 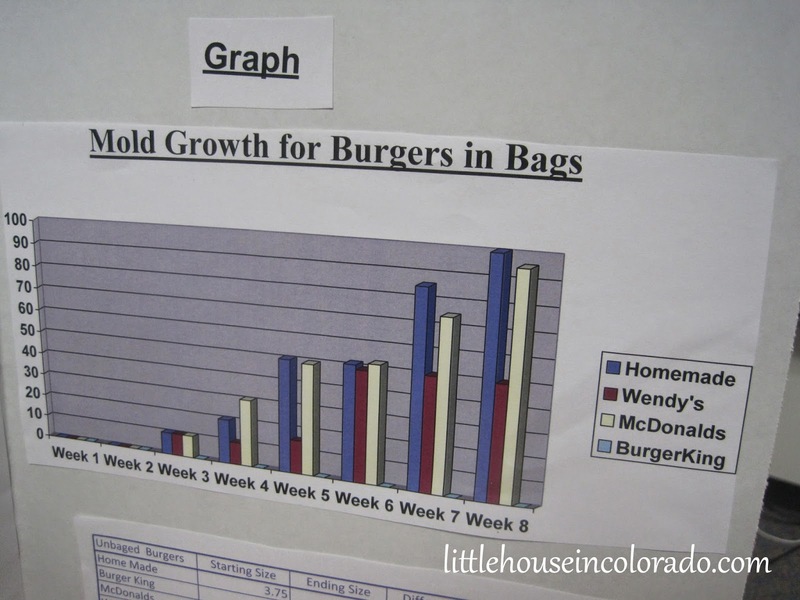 There was also this project that observed which burgers molded the fastest. The Boy looked at this data as suggested we search out Burger King is there is a zombie apocalypse since those burgers would last longer. They didn't mold in 8 WEEKS? We wondered is the "flame broiling" had anything to do with it. After strolling through other classrooms viewing their projects, there was nothing left to do but wait for The Girl's class to be judged. Each student is interviewed by one judge and a panel of 8 judges determines the winners for each class. Mr. LH and The Boy went exploring around the school while The Girl was going through her interview. After her interview, The Girl went out to play while the judges made their final decisions. We wouldn't find out until the following day who won, but we needed to stick around so we could take our tomato plants home. The judges were deliberating for a long time that night before making their final decision. 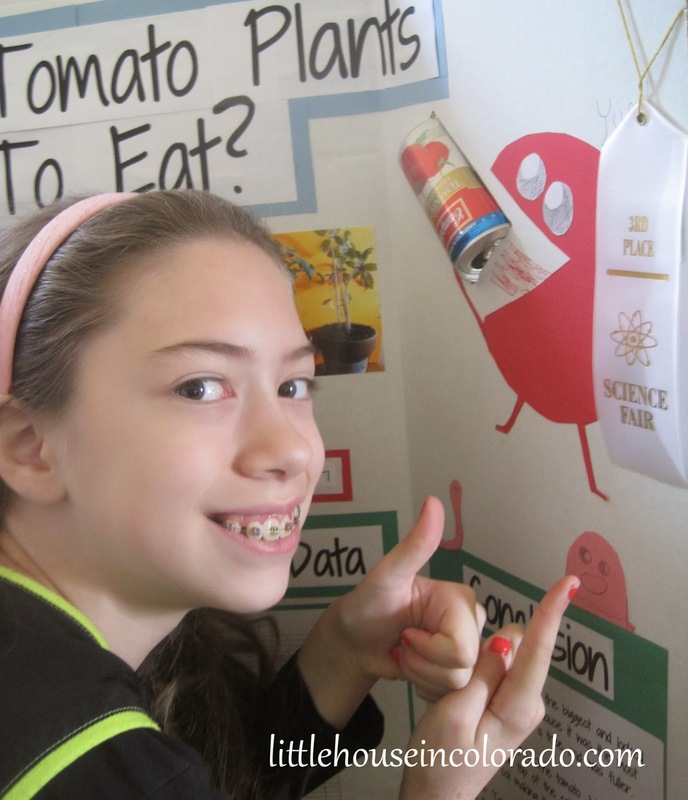 The following afternoon The Girl showed me the 3rd place ribbon she received for her project. She was happy to receive any one of the four available ribbons considering she had some pretty stiff competition in her class! There were projects having to do with bridge building and kinetic energy. I'm more of a biology person so I'm glad that's more of what The Girl gravitates towards. I'm not sure I could be much help with other areas of science. I started some tomato and pepper seeds as usual in early March for our garden. 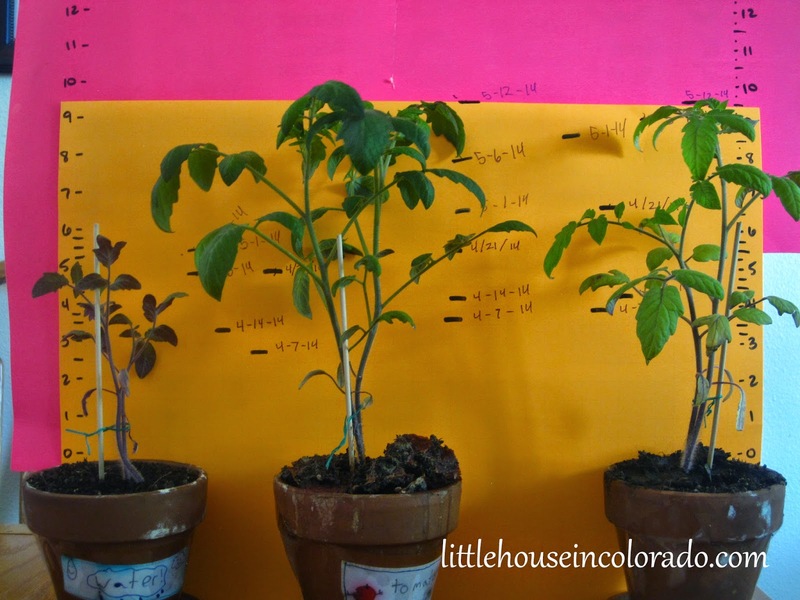 Later, The Girl decided she wanted to experiment on tomato plants for her science fair project so she confiscated three of the best seedlings and we transplanted them in April. 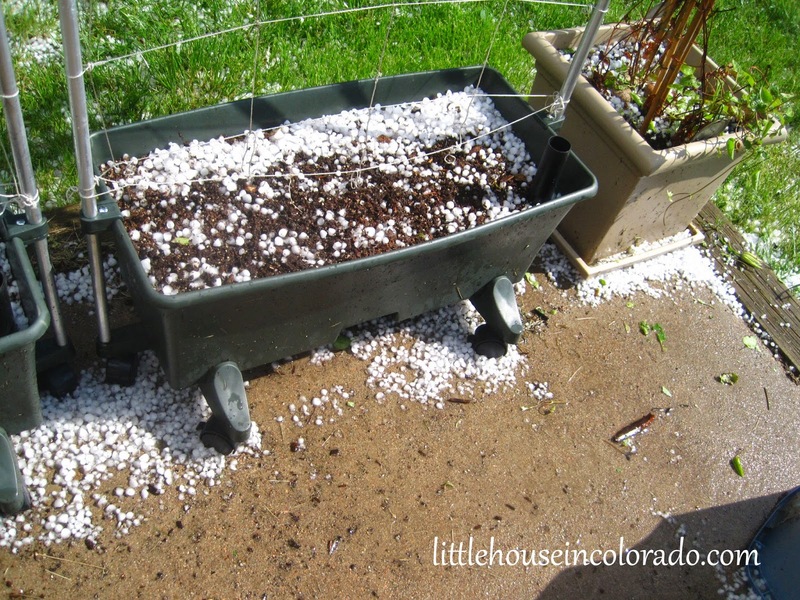 Note: If you do this project (or something similar), I suggest using plastic or enameled planters. The terra cotta pots we used soaked up water from the soil which dampened the labels and loosened the tape. Nothing fell off, but we were pretty worried about it for a bit and the ink on the labels smeared a little. 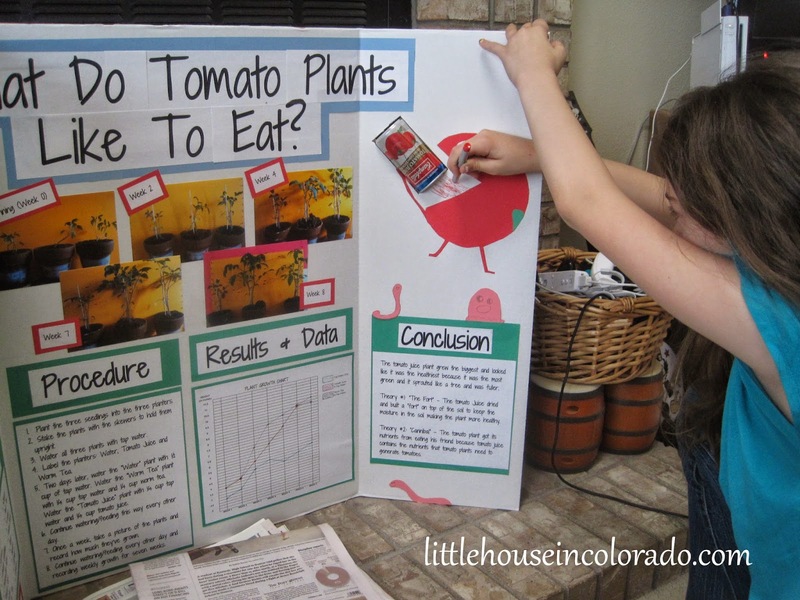 She wanted to find out what the tomato plants preferred to drink - water, worm tea, or tomato juice. We used tap water (straight from the tap since most people probably don't bother to let water from their garden hose sit overnight to de-chlorinate), worm tea harvested from our Worm Bin, and Campbell's Tomato Juice (in the 6-pack of cans so the juice would remain fresh throughout the 7 weeks we were doing the project). The pulp from the tomato juice kept hardening on top of the soil so The Girl would peel it back every time she would need to water. Eventually, she wound up with huge chunks of tomato pulp encased soil on the top. It looks disgusting but we think it may have helped the plant do well in the long run. See below for the actual procedure used . For the headers, The Girl wanted to use a Shadows Into Light font that she had seen at school. We were able to locate it at dafont.com (it's free for personal use). We wound up using the same font for all the text on the project but to make it more legible throughout, we raised the size to 26 for the "normal text". Anything smaller than that seemed too "squished" together and hard to read. We printed everything we would need before starting on the science fair board. The headings, the body text, the graph, labels for the pictures, and finally, the title. I've learned from the past to SAVE the text on your computer just in case some of the papers get messed up in the middle of assembling the science fair board. We've had paper tear, glue smeared across words, accidental cutting, etc. If you have the text saved, you can always just print out a new page. The following text under the science fair project headers are in The Girl's words. I only transcribed for her so we could get through the typing faster (my keyboard is so well worn that many letters are missing and The Girl has a hard time typing on it). Question: Which liquid makes the plants grow faster? 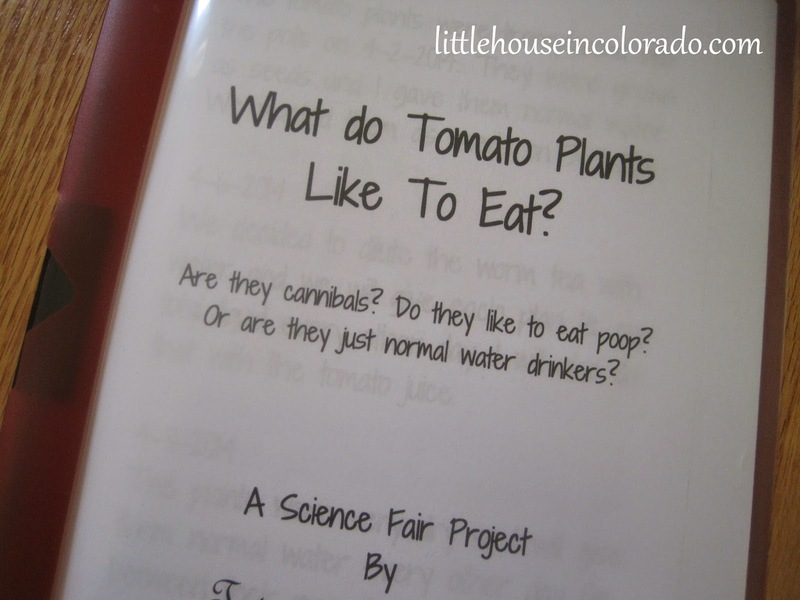 Is it Tomato Juice, Worm Tea or Tap Water? Hypothesis: I think the Worm Tea is going to grow the biggest because the Worm Tea is healthy for the plants. The reason I did not pick Tomato Juice is because it has acid in it and too much acid can kill the plant. 1. Plant the three seedlings into the three planters. 2. Stake the plants with the skewers and twist ties to hold them upright. 3. Water all three plants with tap water. 4. 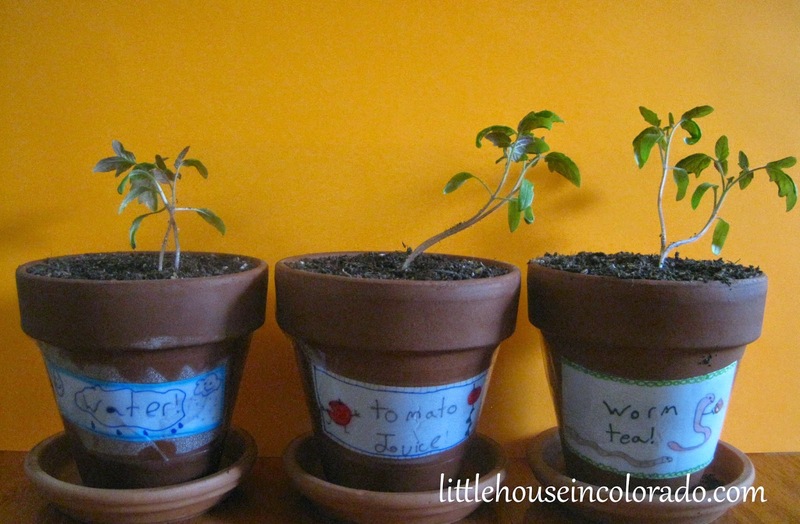 Label the planters: Water, Tomato Juice and Worm Tea. 5. Two days later, water the “Water” plant with ½ cup of tap water. Water the “Worm Tea” plant with ¼ cup tap water and ¼ cup worm tea. 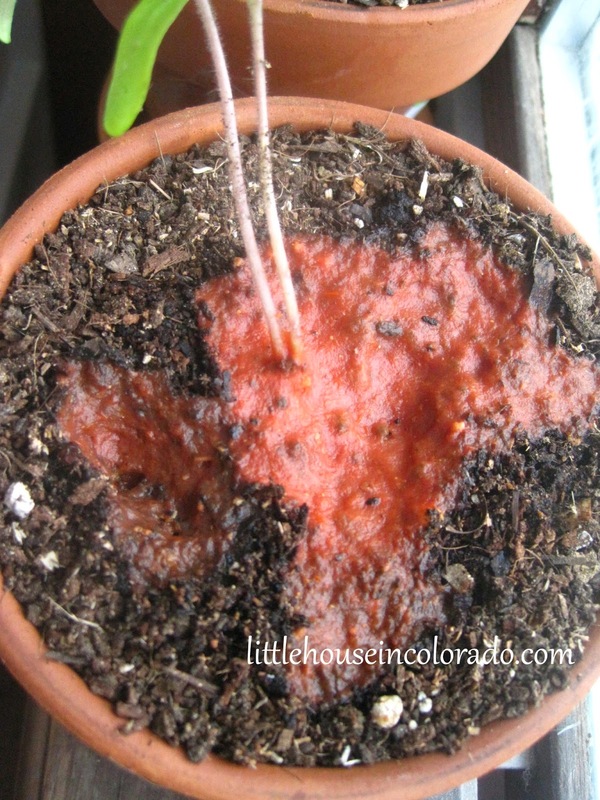 Water the “Tomato Juice” plant with ¼ cup tap water and ¼ cup tomato juice. 6. Continue watering/feeding this way every other day. 7. Once a week, take a picture of the plants and record how much they’ve grown. 8. Continue watering/feeding every other day and recording weekly growth for seven weeks. Results: (This section just had a line graph showing the growth of each plant in 1/4 inch increments. There were also photos of the plants taken weekly, though we could only fit 5 of the 8 photos on the board). Conclusion: The tomato juice plant grew the biggest and looked like it was the healthiest because it was the most green and it sprouted like a tree and was fuller. 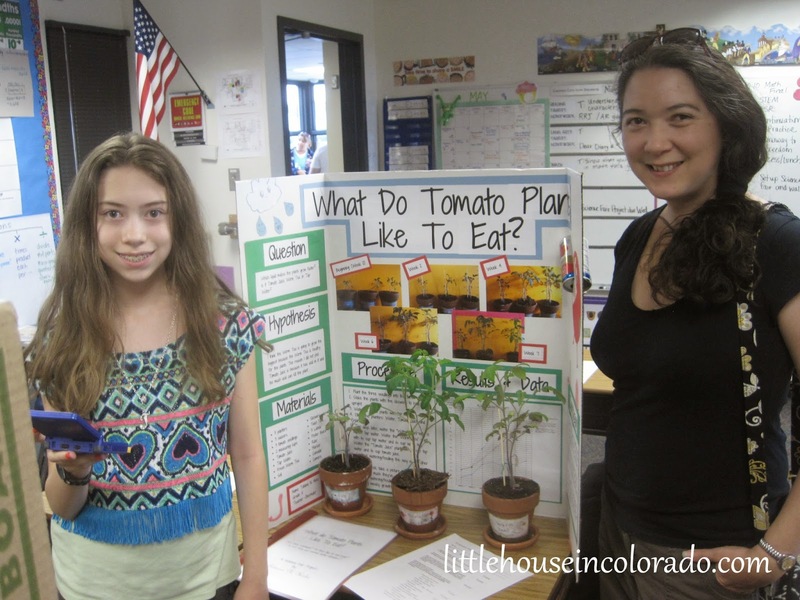 Theory #1: “The Fort” – The tomato juice dried and built a “fort” on top of the soil to keep the moisture in the soil making the plant more healthy. 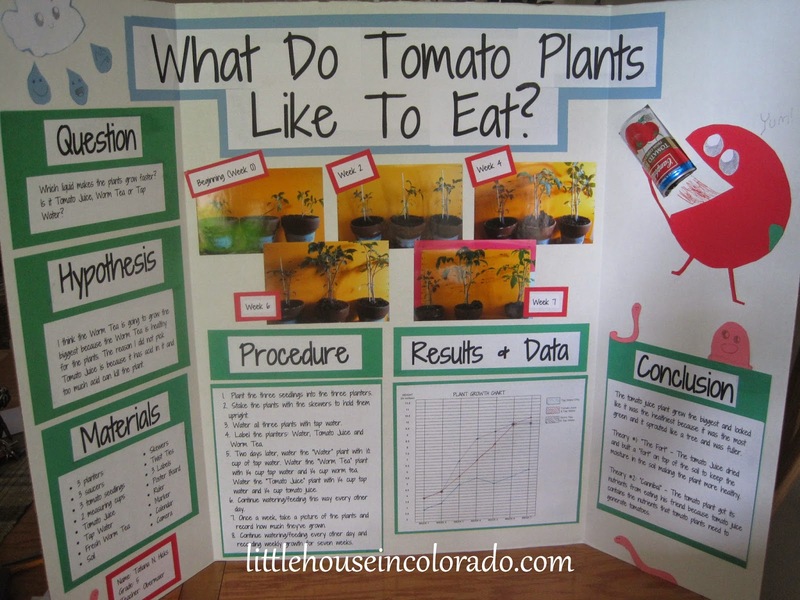 Theory #2: “Cannibal” – The tomato plant got its nutrients from eating his friend because tomato juice contains the nutrients that tomato plants need to generate tomatoes. While we had spent weeks working with the plants, the science fair board sat in a corner of our dining room completely empty. A few days before the project was due, we sat down to work on it. We already had our stack of construction paper and a fresh jar of rubber cement. I picked up the pictures printed we had printed at our area RiteAid photo center (here's a tip if you're looking to save money: I was able to purchase the photos with my RiteAid Up Rewards. If you have enough rewards, you can get all kinds of supplies for your children's projects this way). Walgreens charged 29 cents a print for same day service. RiteAid charged 19 cents a print. 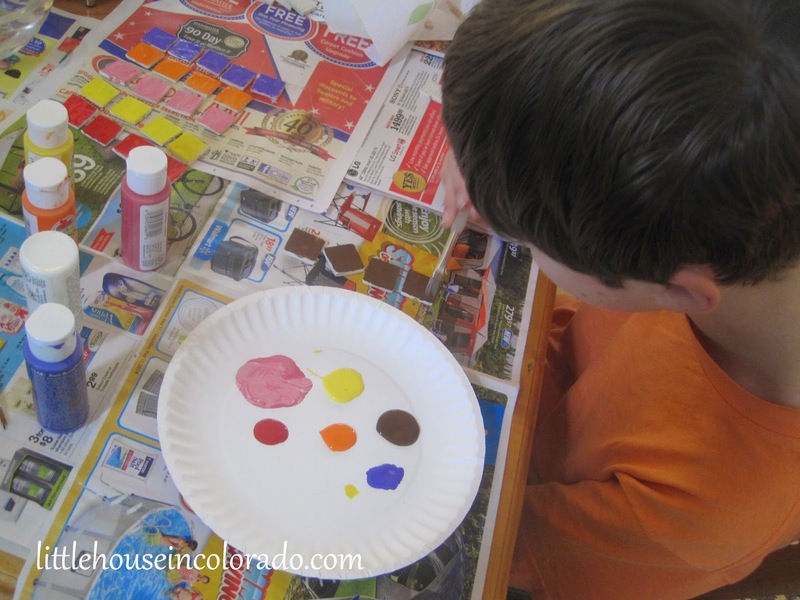 After so many science projects in this house, we usually choose a very simple color scheme with one or two dominant colors and a third accent color. For this project, The Girl chose green as her main color. The board would be left white and then red, pink and blue would be her accent colors (green for the plants, red for tomatoes, pink for worms, and blue for water). She wanted to draw a "foodimal" (a tomato with eyes and arms and legs - like in the movie "Cloudy With A Chance Of Meatballs 2"), especially since the tomato plant fed the tomato juice was clearly the superior plant. We made the "foodimal" appear to be "drinking" a can of tomato juice. Originally we were going to hot glue the can to the board but Mr. LH suggested embedding the can into the board. That worked much better to secure the can in place. Cut the board into an "H" right where you want the can to be. 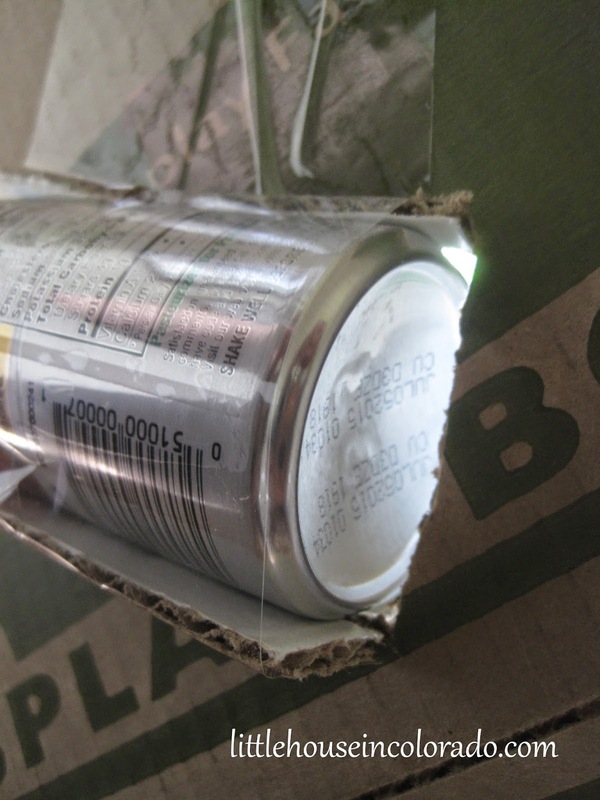 Spread rubber cement on the flaps and press the can into place. We also put a couple strips of packing tape across the back to further hold everything in place. Then The Girl decided she needed to draw in "tomato juice". The Girl was also required to keep a journal with her project recording her observations. She had been keeping her notes scrawled on random pieces of paper so we had to type all those out, print it and bind it into a nice report cover. I don't know if the judges actually took the time to READ the journal, but it was there in case they wanted to (and I think just having it completed was worth 10 points of the score, but I'm not really sure about that - I forgot to check out what the scores were based on). Yesterday was quite an adventure. Mr. LH and I spent the morning painting and refinishing an old wheelbarrow I had picked up at a yard sale. By mid-afternoon, the skies darkened and the wind picked up. The wheelbarrow would have to wait to be finished another day. I left to pick up the "Pickles" from school. 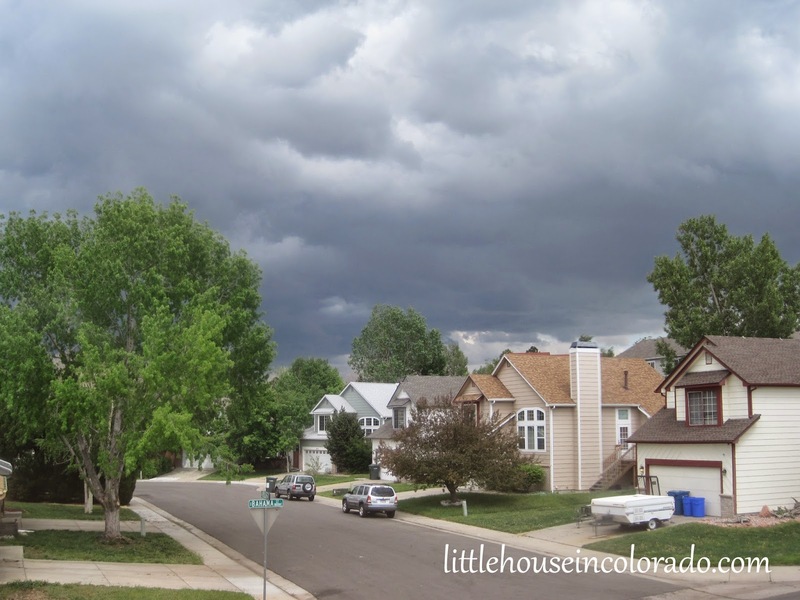 The clouds were really rolling in by then and the thunder and lightening started. I felt like an idiot standing outside the elementary school exposed to the elements with a crowd of other parents. 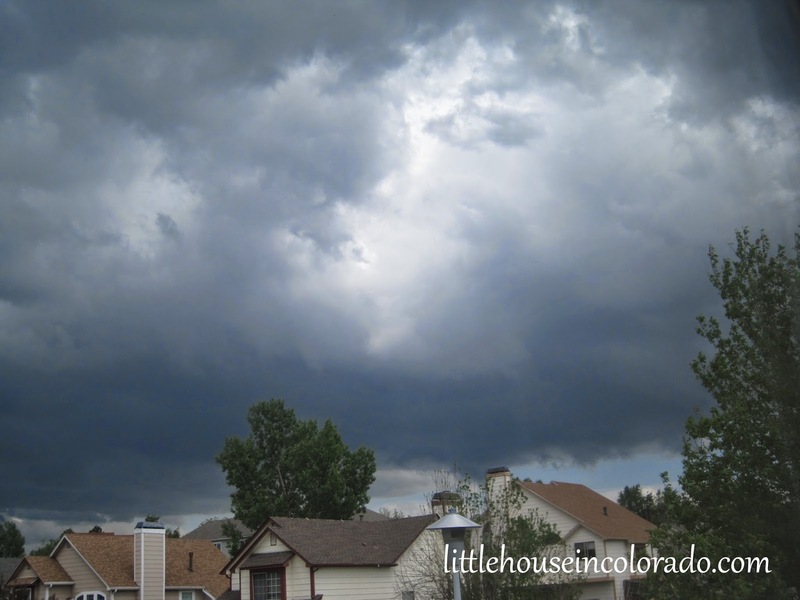 The skies were booming overhead while we waited to pick up our precious children from school. Ten minutes later with The Girl safely with me, we headed over the The Boy's school where he was taking shelter from the storm in his usual spot UNDER A TREE! (sigh) He reported the storm had just passed overhead and dropped some small pea-sized hail. Once home, it started to hail. I rushed outside to try to protect my newly transplanted tomato and pepper plants. 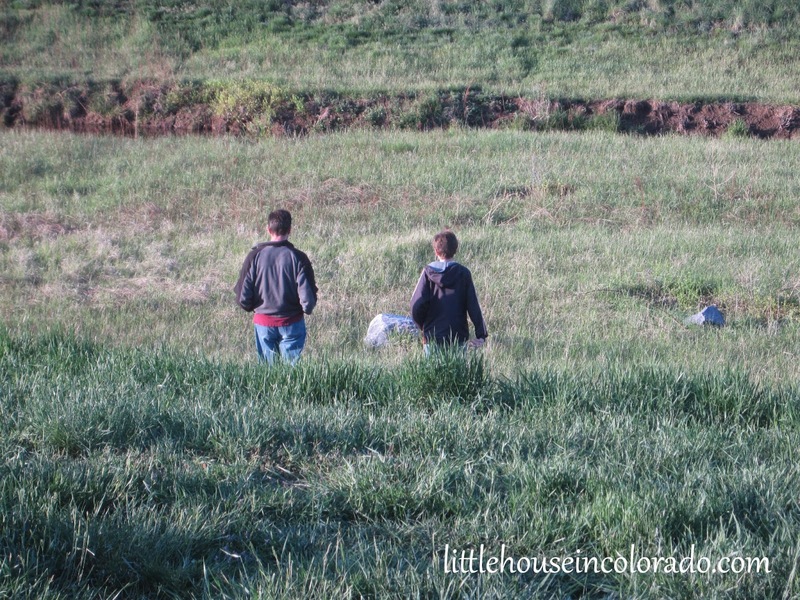 MR. LH and The Boy came out to help since the hail started to come down faster. Right in the middle of us shoving all the containers into the garage, the storm sirens began to wail. I pushed the last plant into the garage, grabbed our weather radio and The Girl's science fair project and headed downstairs to join the rest of the family. 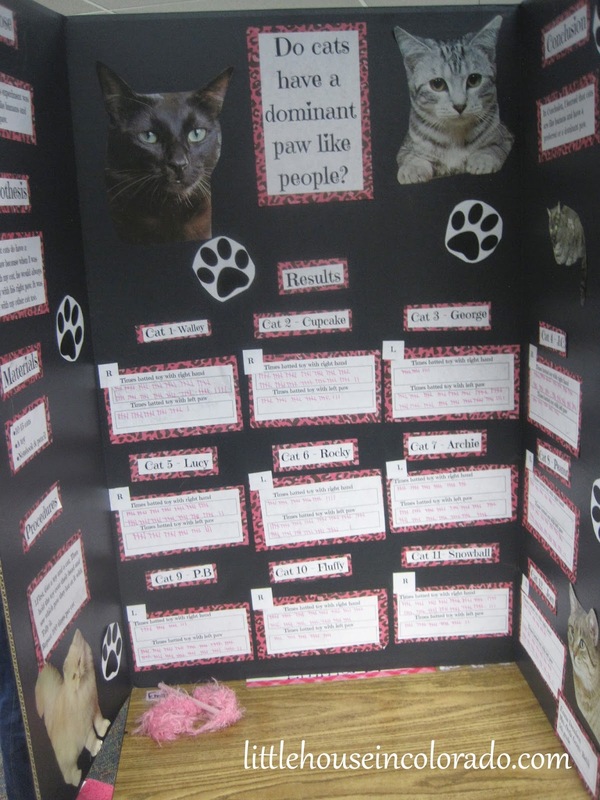 The Girl and I spent countless hours on that project and it was due the next day. I left my purse behind but I was saving that project! 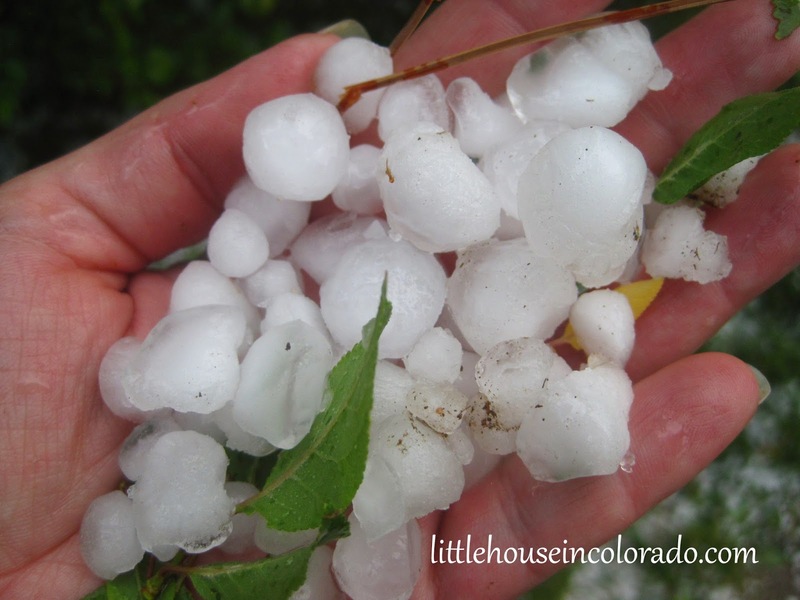 The tornado warning didn't last long but the hail continued to pound the house the whole time. 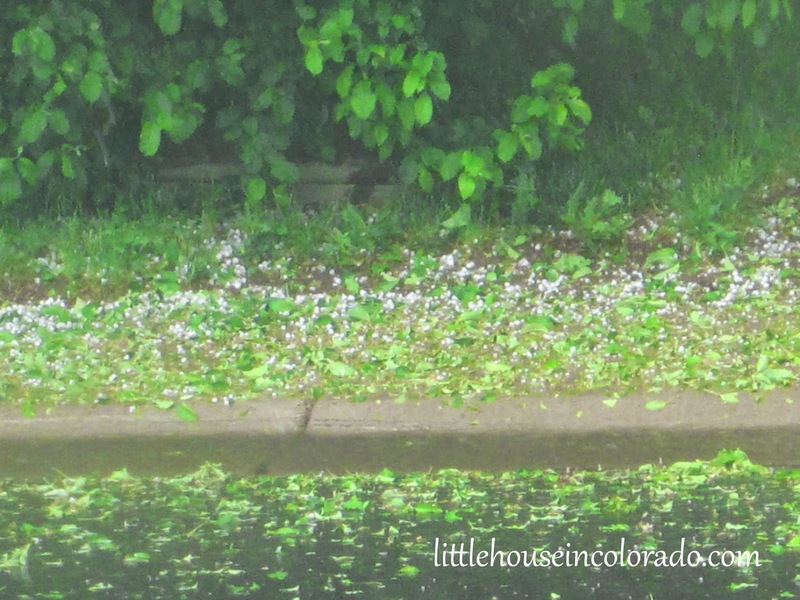 The sound of the hail was so loud we had to shout to hear each other. When the "all clear" finally sounded, the damage had been done. Pea sized to 3/4" hail. There were a few (more) dings to the car, trees stripped of leaves, piles of hailstones and a huge temperature drop outside. Thankfully, there didn't seem to be any major damage and all my tomato and pepper plants were still safe in the garage. 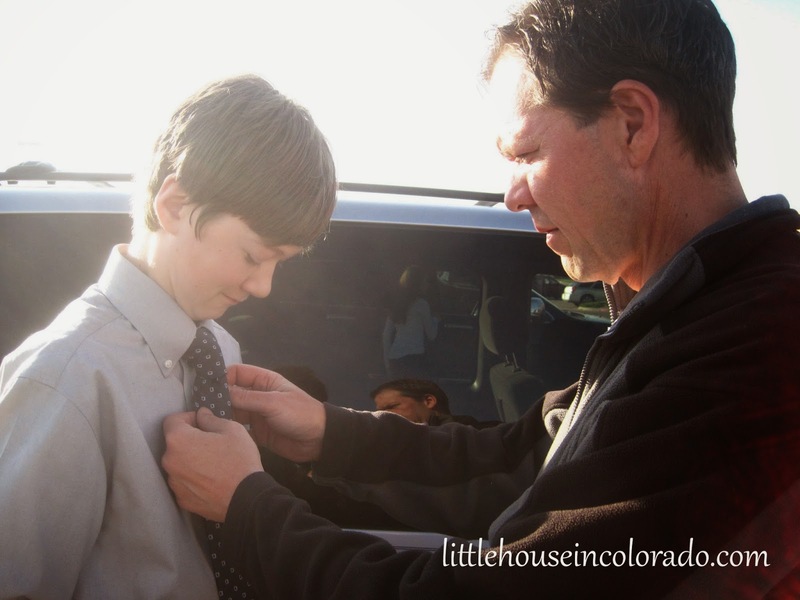 Now we needed to rush to get dinner ready and get dressed for The Boy's 8th Grade Award Ceremony that night. That Award Ceremony was a big deal! 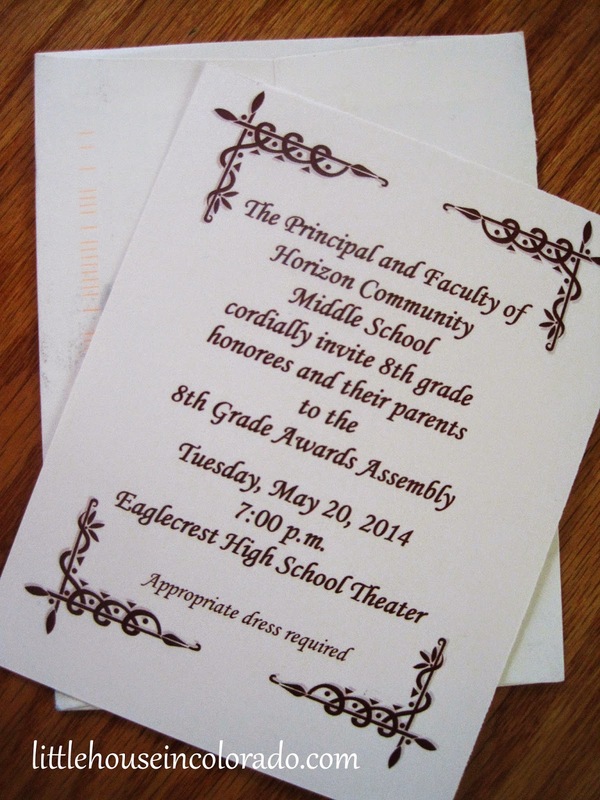 Invitations had been mailed to parents several weeks earlier. It was held at the high school, the students were required to dress up, there were guest speakers, AND refreshments were provided. Really, it was very nice. It made the boy feel very special and happy he was able to participate. The Boy was quite proud (as was I). 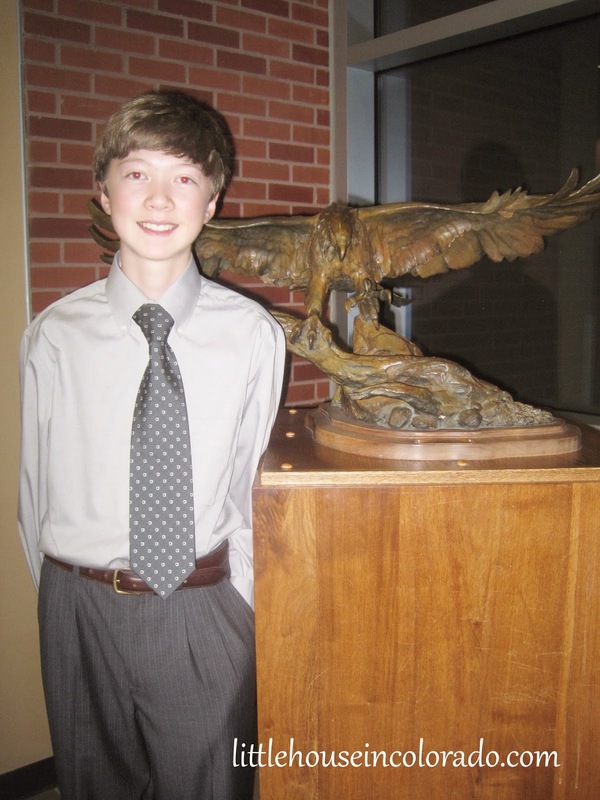 He received the Presidential Gold award for maintaining a GPA of 3.5 to 3.99 throughout 8th grade and received awards for Excellence in Science, Math and Social Studies. I'll have to get him some new dress pants, though. I think he's grown another 2 inches in the past couple weeks. and these are suddenly too short for him.